Sixteen-year-old Miranda Merchant is great at science. . .and not so great with boys. After major drama with her boyfriend and (now ex) best friend, she's happy to spend the summer on small, mysterious Selkie Island, helping her mother sort out her late grandmother's estate. Miranda Merchant is spending the summer at her late grandmother's house on Selkie Island, helping her mother sort out the estate. She needs an escape, and Selkie Island is the perfect place to do just that. Peace and quiet just isn't in the cards for her, though, especially when she meets the mysterious Leo. Miranda is determined to find out more about him - but what exactly is he hiding? I read this book right around the time it first came out, so my memory of the details is a little fuzzy. All I remember is that I was unhappy with the ending and dying for a sequel (which does not appear to be in the works). That said, I can definitely say that my original grade for this book has increased with time - the more I think about it, especially the ending, the more I like it. 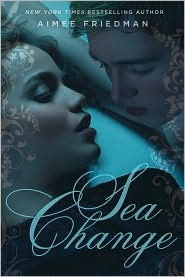 I would recommend Sea Change for teen readers who enjoy light mystery and romance and can handle an ambiguous ending.